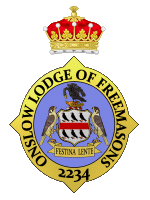 Onslow Lodge held its annual Summer Buffet at The South West Surrey Masonic Centre, Weybourne House in Guildford on Sunday 17th July. Some 80 people attended made up of members of Onslow Lodge together with their families and friends. We all enjoyed pre-luncheon drinks on the veranda overlooking the River Wey before taking our seats in the dining room for a sumptuous buffet. After the meal a raffle was held and £500 was made, being divided equally between Phyllis Tuckwell Hospice and The 2019 Festival appeal which supports the new Masonic Charitable Foundation. The Grand Finale was as usual the now famous “Yockney Quiz” compiled by Onslow’s very own Quiz Master, Gerry Yockney, which got everyone’s grey matter working overtime. This year we were joined by The Honourable Fraternity of Ancient Freemasons, representing Freemasonry for women. Maxine Priestley, their Grand Secretary, was present and will be working with Onslow Lodge, in particular W. Bro David Fairhurst, in presenting Freemasonry to Surrey University students in support of the UGLE University Scheme initiative at this years Freshers Fayre at the end of September. Here are some photographs of the day. The lodge room seats were filled 3-deep in places as 44 brethren assembled to see Past Junior Grand Deacon, W. Bro. Gerry Yockney installed as the 127th Master of Onslow Lodge. This was Gerry’s 6th Installation as Worshipful Master, his second in Onslow Lodge. Installing Master, W. Bro. David Fairhurst, commented on how much Freemasonry, and the world, has changed since Gerry was last Master of the Lodge and said it was good to see renewed enthusiasm from a distinguished Grand Officer now approaching his 80th birthday. Gerry said he was looking forward to leading the Lodge through the next 12 months and, with the Universities’ Scheme now well established, want’s to focus on bringing in members from the local community to give us the continuity that we need to make sure Onslow Lodge can support student members in their brief time with us. Gerry chose a balance of youth and experience in appointing his Officers. Who are all delighted to be serving under such a distinguished Master. 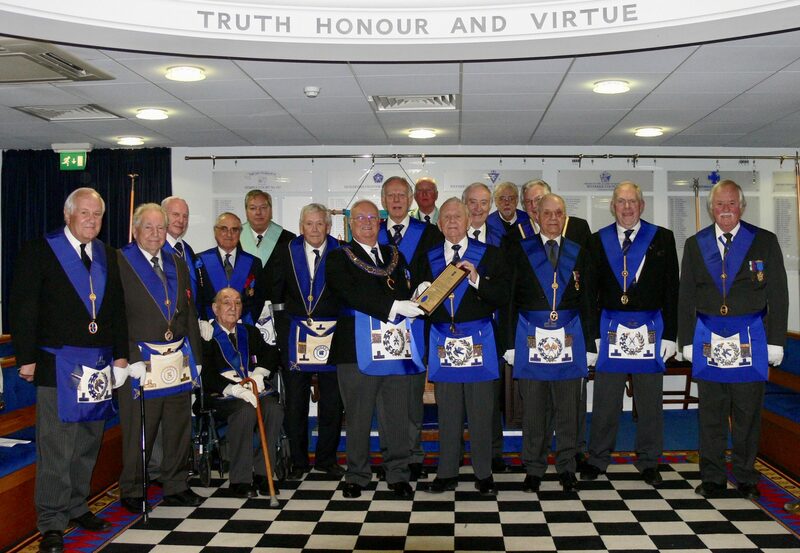 On Thursday 12th of November the Lodge completed some work done as a courtesy to The Grand Orient of Brazil. Bro. Marcus Nascimento came to The University of Surrey last autumn to study for a Master’s Degree. Having been initiated by his father in Brazil over the summer, he was keen to progress in Freemasonry in this country. A long process of international masonic diplomacy ensued to enable Onlsow Lodge to Pass and Raise Bro. Marcus. Having been Passed to the 2nd Degree in October, Bro. Marcus was joined by his father for his Raising ceremony. Both said it was a very special occasion and a very proud father thanked Onslow Lodge for arranging and performing the ceremony. During the ceremony Bro. Marcus was invested with his father Master Mason’s apron which had been brought over from Brazil especially for the occasion. Particular thanks should go to the Assistant Grand Master, RW Bro. Sir David Hugh Wootton, whose decision to institute a ‘Culture of “Yes” rather than a culture of “No”.’ was instrumental in getting this work done. The 5th UGLE Universities Scheme bi-annual conference was held on 7th November at Freemasons Hall in Leicester. The event gathered scheme representatives and university initiates from across the country and foreign provinces and has also celebrated a 10 year anniversary of the scheme. The theme of this year’s conference was “moving on”. And focused on progression of university initiate’s masonic careers after graduation. The plenary session was based around the activities lodges need to undertake to ensure young masons can effectively transit to other lodges after they graduate and how to plan for it from the onset of their masonic careers. The conference also focused on the success of the University Scheme in South Africa, the importance of lodges to working with their universities and the value social media has to the scheme. After lunch, figures and statistics from the scheme census were presented. There are now 66 lodges in the scheme. 57 have so far responded to the census, with 45 providing membership data. It was reported that 794 brethren have been initiated through the scheme in those 45 lodges, 555 of whom are still members. The median age of initiates is 23 years, 62% are students, and 84% of those initiated have been raised within a year. Subs range between £60 and £265, with a mean of £145. Average dining fee within London was reported £40.77 and £16.36 outside the capital. After a successful decade as the scheme president, RW Bro David Williamson PAGM handed over presidential duties to the current AGM, RW Bro Sir David Wooton. To commemorate his time RW Bro Williamson presented the scheme with a loving cup, that has been named in his honour as the DKW Cup. It will be passed on between scheme lodges, with each lodge being allowed to hold it no more than once a year. The cup will be claimed by a lodge if 4 or more brethern from the claiming lodge make a visit to the lodge currently holding the cup. It was announced that the cup will start it’s journey in Leicester, with Wyggeston Lodge No. 3884 being named as the first holder. The cup will encourage brethren to visit other university lodges and bring closer the scheme community.